State Treasurer Michael Fitzgerald has crossed a major milestone. “After 36 years and three days as state treasurer, I’ve become the longest-serving state treasurer in United States history,” Fitzgerald said today. Fitzgerald passed that mark last Friday. The previous record-holder was Grady Patterson, the treasurer for the State of South Carolina. “I knew him when I first took office. He was a fine gentleman. He was a Marine and a very religious fellow and kind of maybe what you’d expect coming from the south — a very smart guy and an excellent treasurer. I thought, ‘Nobody would ever serve that long,’ and, here I am, surpassing him,” Fitzgerald told Radio Iowa. Fitzgerald, a Democrat, was first elected state treasurer in 1982, when he was 30 years old. He’s now 67, just reelected in November to his 10th term, and not ruling out a run for an 11th in 2022. “At this stage in your life you take everything one day at a time and that’s four years off, so we’ll see what happens. Tom Miller chose to run again and he’s in his seventies. I guess 70’s the new 50,” Fitzgerald said, with a laugh. Miller, who is 74 years old, was just reelected to a tenth term as Iowa’s attorney general. No other current state attorney general in the country has served longer than Miller. Fitzgerald’s staff hosted a small reception at the state capitol today to celebrate Fitzgerald’s now-historic tenure as treasurer. 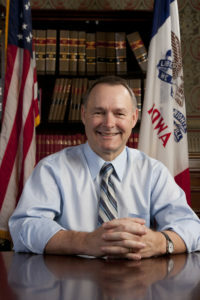 As state treasurer, Fitzgerald is in charge of managing the taxes that are paid to the State of Iowa — often investing the cash on a short-term basis to generate extra income. His office coordinates the College Savings Iowa” program and manages the purchase and repayment of state bonds. Fitzgerald launched the “Great Iowa Treasure Hunt” in 1983 to list unclaimed property from bank accounts and deposit boxes that’s turned over to the treasurer’s office. Iowans can search the “Treasure Hunt” database to see if they have unclaimed property.